Apparently President Benjamin Asher, Aaron Eckhart’s tough-guy Commander in Chief in the —Has Fallen series of films, thinks term limits are for pussies. 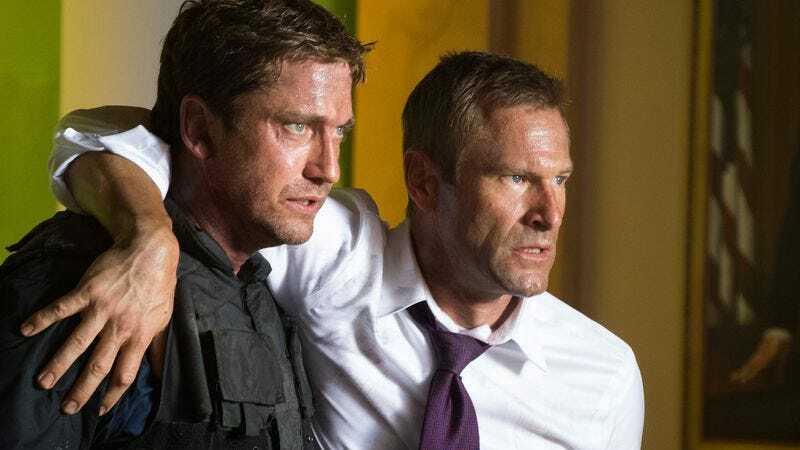 Deadline reports that he and his best bro/bodyguard, Secret Service Agent Mike Banning (Gerard Butler) will return for a third round of stabbing terrorists in the brain in Angel Has Fallen. But why, out of all the glittering landmarks in the world —the Eiffel Tower in France, the Eiffel Tower in Las Vegas, the Great Pyramids of Giza, that other pyramid in Vegas—did writers Creighton Rothenberger and Katrin Benedikt pick one that makes this sound like a Christian take on the material? Because that’s the code name for Air Force One, as it turns out, a code name the real Secret Service will probably change now that this movie has been announced. Harrison Ford could not be reached for comment.